This is the third article in our series of re-posts. It is well worth noticing that it was first published well ahead of the volcanic crisis at Volcan Chilles on the border between Equador and Colombia which taught us that even if a volcano is thought to not have erupted for some 174,000 years, it may not yet be “extinct”. If this template is applied to the volcanoes of the Three Sisters area, none of the volcanoes considered extinct whose last identified period of activity ranges from 100,000 to a mere 14,000 years BP can be said to be truly extinct. Situated on the Cascade plateau, the region known as the Tumalo Volcanic Center was active in the Pleistocene epoch with explosive eruptions between 700,000 and 170,000 years ago that left extensive pyroclastic deposits on which basaltic and basaltic andesitic lava flows formed a great number of shields. One of these eruptions resulted in tephra deposits as thick as 13 meters (42 feet) composed largely of fist-sized and smaller white pumice clasts which is exposed in numerous pumice quarries. Tephra deposits from this event have even been found in northern California and in cores from the northeast Pacific Ocean. Over the past 170,000 years, several complex volcanoes grew consisting of a shield topped by an andesitic stratocone. The most well known of these are the Three Sisters; Faith, Hope and Charity counting from North, but they are far from the only ones of interest in this area and there are also several young shield volcanoes and buttes, making the history and evolution of the area quite convoluted. Probably the oldest of these complex volcanoes is Broken Top, even if it’s exact age in relation to North Sister is not known. It is situated some 6 km (3.7 miles) ESE of South Sister with an elevation of 2,797 m (9,175 ft) and a prominence 663 m (2,175 ft). Broken Top is an extinct, heavily glacially eroded stratovolcano consisting of predominantly basaltic andesite with interbedded andesite, dacite, and rhyodacite. Its initial eruptions of basaltic andesite lava contributed to a base shield. Erratic eruptions continued afterward, erupting more silicic lavas. Much of the current cone is occupied by flows of andesite, dacite, rhyodacite and pyroclastic flows extending from the subordinate shield volcano to the summit. Eruptive activity stopped roughly 100,000 years ago, and glacial erosion has reduced the volcano’s cone to where its contents are exposed on both sides of the central spine. The current crater, 0.8 km (½ mile) in diameter and heavily eroded, was most likely formed by subsidence. Second oldest is the North Sister, Faith. With an elevation of 3,074 m (10,085 ft) and a prominence of 831 m (2,725 ft), North Sister is a considered to be a shield volcano consisting primarily of basaltic andesite. It is estimated that it last erupted over 100,000 years ago and is considered to be extinct. The North Sister possesses more emplacement dikes than any similar Cascade peak. Many dikes were pushed aside by the intrusion of a 300-metre (980 ft)-wide plug dome that now forms the mountain’s summits; Prouty Peak and the South Horn. The presence of these plug domes argue that the classification of North Sister as a shield volcano is erroneous and that she too is a complex volcano. The remainder of the peak is chiefly loose debris held in place by the dike system. It is heavily eroded and considered the most difficult and by far most dangerous peak to ascend. If Broken Top and North sister are to be considered to belong to a first period, the second saw the creation of Tumalo Mountain and Middle Sister. Tumalo Mountain is a 2,371 m (7,779 ft) high shield volcano located 15 km (9.5 miles) SE of South Sister. Ice Age glaciers carved a large cirque into the northeast flank of the mountain, producing a bowl which is popular with local backcountry skiers. There is not much information available and she seems to be more or less unstudied. Middle Sister is the smallest and most poorly studied of the sisters. It is a 3,062 m (10,047 ft) high stratovolcano with a prominence of just 344 m (1,127 ft) consisting primarily of basalt but has also erupted andesite, dacite, and rhyodacite. The mountain is shaped as a cone that has lost its east side to glacial erosion. Being less than 55,000 years old and thought to have last erupted approximately 50,000 years ago, it too is considered to be extinct. However, the most recent lava flows at Middle Sister are dated to 14,000 years ago, more or less contemporary with South Sister. At 3,157 m (10,358 ft) with a prominence of 1,706 m (5,598 ft), South Sister is not only the youngest of the Three Sisters but also the tallest. Overlying an older shield structure, it is a stratovolcano no more than 50,000 years old and thus contemporary with Middle Sister “Hope”. South Sister last erupted about 2,000 years ago. Its eruptive products range from basaltic andesite to rhyolite and rhyodacite. The first period of activity, the Rock Mesa eruptive cycle, spread tephra from flank vents from the south and southwest flanks, followed by a thick rhyolite lava flow. The second cycle, the Devils Hill eruptive cycle, was similar but was caused by the intrusion of a dike of new silicic magma that erupted from about 20 vents on the southeast side and from a smaller line on the north side. The final eruptive cycle which ended about 2000 years ago, produced several thick and glassy rhyodacite to rhyolite lava flows. South Sister has an uneroded summit crater about 400m (0.25 miles) in diameter that holds a small crater lake , Teardrop Pool, the highest lake in Oregon. 16 km (10 miles) SSE of South Sister, the 2,764 m (9,068 ft) high Mount Bachelor with a prominence 812 m (2,665 ft) was formed between 11,000 and 15,000 years ago as a shield volcano but was later capped by a stratovolcanic cone as the eruptions apparently became more explosive and silicic over time. Composed mainly of basalt and basaltic andesite, it is the youngest prominent volcano in the Three Sisters area and, surprisingly, the best studied. It last erupted between 8,000 and 10,000 years ago and is entirely covered with ash from the catastrophic eruption of Mount Mazama about 6,850 years ago. Today, Mount Bachelor is a popular ski resort. The summit of Mount Bachelor consists of a cluster of small pyroclastic cones on a line to the Northwest. There are also several shallow collapse craters, low blocky domes, and several lava plugs in the cirque on the north side. The upper flanks are covered with lava flows many of which emerge from lava tubes and display well preserved levees and flow fronts. Several small parasitic shields on the south and north flanks give the cone its present-day north-south elongation. There is no geothermal activity. The first period occurred approximately 18,000 – 15,000 years ago during glacial retreat. The activity was concentrated to the central part of the chain and built a shield volcano; Sheridan Mountain. Near Sparks Lake, a group of vents formed beneath glacial ice and interacted with the ice to form hyaloclastite deposits and thick lava flows constrained by glacial ice. The resulting steep sided plateau, not unlike a tuya, is capped by Talapus Butte and Katsuk Butte. The second period of eruptive activity was along the chain of scoria cones and lava flows that extends from the south side of Sheridan Mountain to the explosion crater at the south end of the chain. During the third period, the shield volcano which is capped by Kwohl Butte and the shield that underlies Mount Bachelor were built and towards the end, the summit cone of Mount Bachelor was extruded. The oldest glacial moraines recognized on Mount Bachelor are approximately 12,000 years old so the cone had nearly attained its present size by then. The moraines are overlain by the youngest lava flows of the third episode. The fourth and last eruptive period occurred approximately 8,000 to 10,000 years ago and produced a scoria cone and lava flows on the lower north flank of Mount Bachelor. All activity ended before 6,850 BP since tephra from the climactic eruption of Mount Mazama is found on all deposits of the Bachelor chain. The youngest volcanic mountain of the Three Sisters area is 2,096 m (6,876 ft) tall Belknap Crater, 13 km (8 mi) NNW of North Sister. It is thought to be the result of three principal eruptive episodes between 3,000 and 1,500 BP. Belknap volcano is a small shield volcano with a capping cinder cone and is a Holocene example of the process which built the High Cascade Platform during the Pleistocene. The broad shield of Belknap is 8 km (5 mi) in diameter and estimated to be just over 500 m (1,700) feet in maximum thickness with a total volume of 5.5 cu km (1.3 cu mi). The summit cone of the volcano surmounts what is probably a core of cinder cones which intermingle with peripheral lavas. The main bulk of ash from Belknap, which has been traced over an area exceeding 100 square miles, was then ejected from a now disappeared large south crater. Some time before 1500 BP, basaltic lava flowed eastwards up to 11 km (7 mi) from their vents. Approximately 1,500 years ago, basaltic andesite flows issued from vents at the north and south bases of the cone. Lava poured 12 miles to the west and ash was ejected from the northernmost of two summit craters. A number of other eruptions also occurred in the general area during roughly the same time period. To the south are several cinder cones and associated lava flows, including Collier, Four-in-One, and Yapoah cones. Four-in-One Cone has been dated at about 2,000 years old while Collier is dated at about 1,600 years old. About 1,300 years ago (all by C14 measurements), a series of small spatter cones formed between Belknap and Blue Lake. North of these, a phreatic explosion blasted out the crater which is today occupied by Blue Lake. Future activity. In 2000 satellite imagery showed that there was a tectonic uplift 4.8 km (3 miles) west of the South Sister of up to 51 mm (2”) per year in the early 2000s. The ground likely began to bulge in late 1997, when magma started to pool about 6.4 km (4 miles) underground. In March 2004, an earthquake swarm with ca. 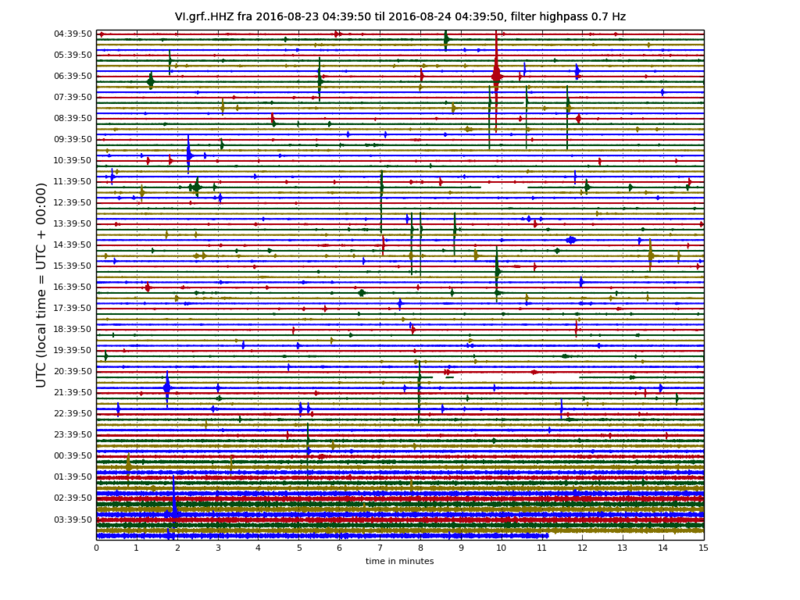 1000 earthquakes within 48 hours occurred with the epicentre in the area of the uplift. By 2007 the uplift had slowed somewhat, though the area was still considered potentially volcanically active. In February 2013 scientists determined that the uplift had slowed to a rate of about 7.6 mm (0.3 inches) per year. Even though this episode of seismic unrest following a magmatic emplacement is mostly over, future episodes and further emplacements are quite likely. Whether or not this will lead to an eruption in the coming decades or centuries is uncertain. Thank you, Henrik for bringing this forward. A couple of years ago I had the opportunity to visit the John Day fossil beds which are about 150km east of the sisters. Fascinating because that part of the country has been covered with ash at somewhat long yet regular intervals, basically preserving samples of evolving species. They have excellent exhibit and working archaeologists. Well worth the effort to see it if your in the area. As is Medford, Oregon? 😉 As there’s a volcanic fossil there, the 3,576-foot-tall, 30 million years old Roxy Ann Peak and it’s sort of slap-bang in the middle of all those volcanic parks and monuments with I5 passing through, it’d serve as an excellent base for a volcanoholic. With plenty of minerals as well as fossils, I wouldn’t mind living in the area myself. did a lot of exploring back in the 90’s. Imagine the money one could make if you cloned them and put them on the market..
Geology teacher and the Earth science class of the class of ’71..
21 August 2017 should be a good time to visit the area. 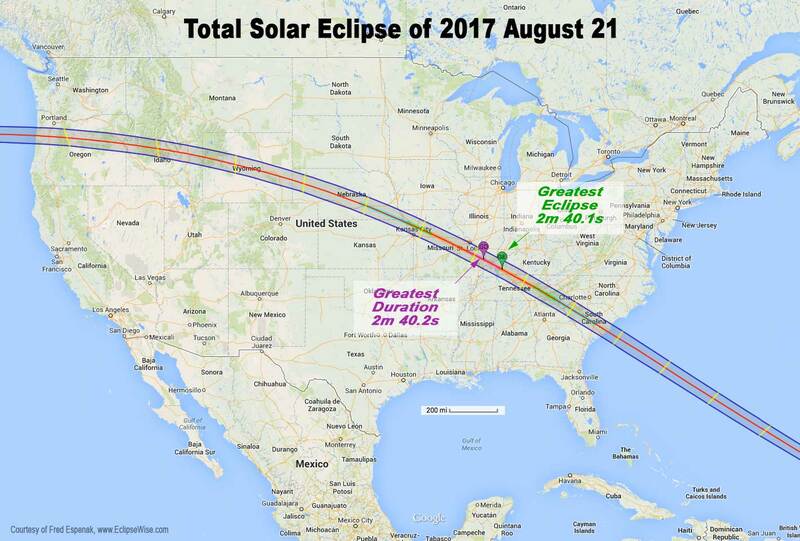 The path of totality of the great american eclipse should pass just to the north. The mountain itself will not have totality. Black Butte will. Right over NE Oregon Too.. Chased one in ’78 in SE Washington. charter in a very nice Piper Dakota. Eugene is not on the track of totality. Don’t go for a 99% eclipse f you can get totality: you should see a total eclipse once in your life. Albany is good but being close to the coast, has a higher chance of cloud cover. Just over the other side of the Cascades is better. The Teton mountains and the southern end of Yellowstone are also on the track, as is Kansas City. Pick your choice. And goes right over my house in SC. Cant wait. Knowing my luck, there will be a hurricane or it will be unbelievably hot or unbelievably humid. Or all three. If not, then I will have to spend the afternoon contending with fire ants and/or yellowjackets with a moccasin, gator, or eastern diamondback thrown in for good measure. As a fellow fire ant victim, it may hurt getting bit, but nothing is quite as satisfying as a cold water hose streaming on your bitten feet. E/V Nautilus is about to explore the WWII aircraft carrier USS Independence that was scuttled in 1952. It was a participant of the atomic testing at Bikini Atoll. There is supposed to be a plane still on her. This is live video. “According to local reports, the level of the Bláfjallakvísl glacial river is unusually high. Bláfjallakvísl originates from the northern side of Mýrdalsjökull and people are advised to show caution when crossing the river. Assume these are weather-related, unless IMO states anything to the contrary. Could this be the first indication of an impending eruption/escalating unrest? Hardly the first indication and most likely nowhere near large enough intrusions to cause an eruption. That said it is pretty much certain that we will see more episodes like this before the next eruption. From the map I would guess it originates from northwestern part of Vatnajökul… Take a look! Very shallow. There seems to be a lot of data available but couldn’t find any seismographs. Its probably just me, but the topography of Campi Flegrei reminds me of a pot of boiling porridge. Likely a functional relationship… with a different timescale. That simile is actually not far off as the “lid” over CF has been found to be very much like non-solidified concrete, Roman formula. I didn’t zoom in to look but I was daydreaming about Pompei, anything to see there? Just a coincidence. Vesuvius is believed to be Oct 24, rather than Aug 24, based on coins and other archeological evidence. Why was I locked out of this site for about half an hour, ending sometime in the minutes before this comment’s timestamp? I was blocked from even *reading*, let alone commenting, which seems excessive, especially in light of the minor little matter that I had not done anything wrong. Same for me (well, only tried once). I had an error message about ‘maintenance’ being done. Apologies, The WordPress installation needed an update and one of the plugins we used caused a hiccup in the process. All is well now. Hiccup made old problem with very narrow rendering of page on mobile device return. I’m on an Android phone and the page looks awful. This also happened last time WordPress was updated so I’m guessing the same fix has to be reapplied again. I’m at the moment unable to locate the actual seismograps/squigly lines, but if that’s due to my Italian being a bit rusty, or the computer I’m on being a piece of **** which crashes when trying to open half the links I click on, I don’t know. To add to the mayhem, a major earthquake was reported from Myanmar, with significant damage to temple monuments. So if Mount Bachelor has no geothermal activity doesn’t that mean it’s technically extinct? Another good question! “Geothermal activity” should be interpreted as “geysers, hot springs and fumaroles” meaning that there are no surface signs of ongoing magmatic activity at depth. That does not rule out that there are substantial amounts of eruptible magma still left in the conduits and magma reservoirs, magma that could be erupted should there be a substantial infusion of fresh, juvenile magma into the system from the mantle region. So no, the lack of surface activity at present does not mean that Mt Bachelor is extinct. So basically the storage system is in a crystal mushy “hibernation” state then, like Yellowstone’s storage system i.e. not enough melt to erupt yet. In that case, I would think the USGS should be properly monitoring it- it’s current alert level is unmonitored. Can the Mt Bachelor situation be applied to McLoughlin in Oregon too? It doesn’t seem to be considered active by authorities, but to me looks like it has been active in post-glacial times. 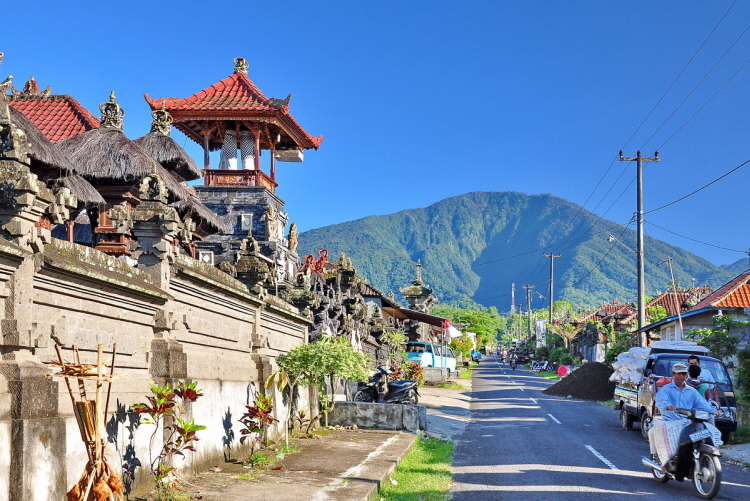 Compared with several other volcanoes such as Batukaru on Bali (pictured below, it is completely unstudied, unmonitored and of which the only thing we know is that it hasn’t erupted for at least 200 years), Mt Bachelor is in an area which is monitored even if the volcano itself isn’t. One more time on my favorite topic … Long Valley Caldera. How does the current inflation around the epicenter of this activity not worry people? It is so close to Mammoth Lakes that I’d be worried if I lived there. I understand there’s property values and warning-fatigue, but surely the current activity warrants some kind of messaging from the USGS? The current unrest may be normal ‘breathing’, or it may be a precursor to an eruption or (my bet) it may be a precursor to something hydro-thermal. Increased hydrothermal activity (which I believe is the current interpretation) can only happen if there is an injection of more energy into the system. This comes from magma that is being injected into the system from the deep. One thing to keep in mind is that while it doesn’t take much juvenile magma to cause an increase in hydrothermal activity, truly huge amounts are necessary if there is going to be an eruption. To use your kitchen stove as an analogy – you can easily heat water on it by adding small amounts of energy in the form of electricity but in order to melt the stove you’d have to use a blowtorch. Mt Baker had a ten-fold increase in fumarolic activity in 1975 and nothing else happened. So whatever happened deep in the system must’ve been quite insignificant. Similarly, I don’t see much of note now at Long Valley. Obviously, we don’t want another repeat of the panic (*false alarm*) in Mammoth Lakes that happened in the 80’s, so CalVO will only make statements if something very substantial occurs. I’ve answered this before, but Long Valley is in a highly seismic region. Not all earthquakes there are volcanic. Similarly, the inflation isn’t really anything particularly enormous in the grand scheme of things. The majority of eruptions at Long Valley have occurred at Mammoth Mountain in more recent times, which likely acts to relieve a bit of pressure here. Most eruptions at mammoth mountain have been effusive, with the only more explosive eruptions occurring way long ago. Also, not one of the earthquakes is above a 3.0 magnitude. There are many volcanoes that are likely worth worrying about, but I personally don’t think Long Valley is one of them. Hmm, I wonder why this ended up here in the bottom.